The same laser system being developed to blast tiny spacecraft between the stars could also launch human missions to Mars, protect Earth from dangerous asteroids and help get rid of space junk, project leaders say. 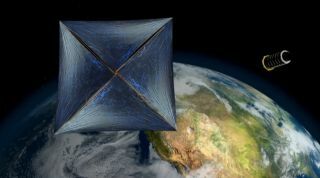 Last month, famed physicist Stephen Hawking and other researchers announced Breakthrough Starshot, a $100 million project that aims to build prototype light-propelled "wafersats" that could reach the nearby Alpha Centauri star system just 20 years after launch. But such technology could be used for much more than just interstellar flight, Lubin said. "You build one [system], and then you have, suddenly, a radically transformative tool on your hands," he said earlier this month during a presentation with NASA's Future In-Space Operations (FISO) working group. "You can enable rapid interplanetary travel between here and Mars," Lubin said. "You can defend the planet completely. You can capture asteroids — useful for mining, composition analysis." Other potential applications include beaming power to distant spacecraft, de-orbiting space debris and perhaps even terraforming (modifying planets to make them Earth-like), he added. At the heart of Lubin's envisioned "directed energy" system is an enormous array of space-based, solar-powered lasers (though Breakthrough Starshot plans to place this array on Earth, at a high-altitude locale). These linked-up lasers would blast out a 100-gigawatt beam for a few minutes — the rough equivalent of the energy generated during a space shuttle launch, Lubin said. This tremendous force would be imparted to the postage-stamp-size wafersats, each of which would ride the laser beam using a 3.3-foot-wide (1 meter) sail. For perspective, it has taken NASA's conventionally powered Voyager 1 probe— the most far-flung object ever launched from Earth — nearly 40 years to travel 12.5 billion miles (20.1 billion km). Voyager 1 would have to keep flying for another 100,000 years to reach Alpha Centauri (if the probe were headed toward that system, and it's not), Lubin said. Directed energy could propel spacecraft considerably larger than wafersats as well. For example, the same laser array could power a 22-lb. (10 kilograms) probe, with an appropriately larger sail, through space at speeds just 10 times less than those achieved by a wafersat, Lubin said. "You have a lot of flexibility in this program," he said during his FISO talk. "This same system, one laser driver, is capable of driving any mass, from the very tiny to the very large, including human-capable craft — not to the stars, but for use in the solar system." Mars is a prime potential target; putting boots on the Red Planet is, after all, the main long-term goal of NASA and the international human spaceflight community. Conventional chemical thrusters could get people to Mars in eight months or so, but a laser-sailing system could cut that travel time to a matter of days or weeks, Lubin said. "If you could ever build another [laser array] on Mars, you could ping-pong yourself back and forth between them and shuttle humans as well as cargo back and forth to Mars in less than 30 days," he said. The potential uses don't end there. For example, the powerful laser array could also nudge dangerous asteroids and comets away from Earth, by vaporizing material on their surfaces and thereby changing the objects' orbits slightly, Lubin said. The same principle could also allow valuable asteroids to be captured for mining purposes. In addition, the laser could be used to de-orbit pieces of space junk circling Earth, and to beam power to distant spacecraft. "This is not a one-application system," Lubin said. Building a laser array — whether it's on the ground or in space — won't be cheap, and it won't be easy; Lubin estimated that getting such a system up and running would take at least 20 to 30 years of dedicated effort. Furthermore, making a space-based array economically feasible would probably require dramatic reductions in the cost of access to space, the cost of space photovoltaics (solar panels) and the cost of laser power, Lubin said. And humanity would have to figure out ways to build space structures perhaps 100 times larger than the $100 billion International Space Station, which is as long as a football field. "We cannot find a reason we cannot do this," Lubin said. "This doesn't have to be science fiction."